Jake T. Austin wears red low cut Converse “Chuck Taylor” All Stars in the film. Bruce and Andi with their pet Jack Russell terrier named Friday. It’s tough being an orphan placed in the foster care system. It’s tougher if you are brother and sister and want to still live together. It’s even tougher if you have a pet dog and you live in New York City. This is the dilemma that Bruce (Jake T. Austin) and Andi (Emma Roberts) find themselves in as Hotel for Dogs begins. As their social worker Bernie (Don Cheadle) continually tells them, it’s not easy to find foster parents who are even willing to take on a brother-sister combination. And usually the ones that are willing to take them in are more interested in the checks that they receive from the foster care system than they are in parenting an existing family. Their current foster parents Lois and Carl Scudder (Lisa Kudrow and Kevin Dillon) certainly fit into that category. They are two untalented wannabe rock musicians who spend their days dressing the part and rehearsing their out-of-tune vocals. Even a howling dog sounds better! They are also on some sort of special diet, which they impose on the kids in plastic trays of unappetizing looking mush. Lois is particularly worried that the kids will try to steal from them. Why do Bruce and Emma put up with this and insist on staying where they are, when they could move out to the suburbs with a nice couple willing to take them in? After all they are intelligent, attractive looking, and well mannered kids who were raised originally in a loving white collar home. The answer is their pet dog, of course! (This is America; you shouldn’t even have to ask that question! Pets rule!) Foster kids aren’t allowed to have pets, and the only way they can hang onto Friday, their beloved Jack Russell terrier, is to stay in Manhattan and hide him from their foster parents and the authorities. This takes quite some maneuvering about, and we quickly learn that Friday has developed incredible street smarts. He is able to find Bruce and Andi wherever they are in the city, he can ride up and down the fire escape to their bedroom window using a pulley system that Bruce made for him, put his leash on and off, and hustle for food as well as any panhandler. Bruce and Andi often have to cover for Friday when he gets into mischief inside the Scudder’s apartment, but it’s all worth it for those wonderful kid-dog moments when they show their love for each other. Andi, Bruce, Dave, and Heather decide to create their own dog shelter for strays in an abandoned hotel. The main story line of Hotel for Dogs gets started in earnest when one day Friday leads Bruce and Andi into an abandoned downtown hotel where two other dogs have been living. There is plenty of space and lots of old furniture and other things to work with. Bruce and Andi realize that they have stumbled onto the solution to their problem of where to keep Friday. They know they have to do something. Already the animal control agency (full of mean-spirited and clueless workers) has caught Friday once in a roundup of stray animals, and it cost Andi all of her spare cash to bribe the corrupt worker to give Friday back to them. Andi and Bruce start to set up the hotel as a home for dogs. Soon they enlist the help of two young pet store workers Dave (Johnny Simmons) and Heather (Kyla Pratt), who help them procure food and supplies and run the place. The dog population at the hotel starts to grow, as Bruce brings back strays he finds and other dogs show up. Bruce carefully lists each new resident in the hotel guestbook. Bruce is also a mechanical genius. There is a quick flashback in the film showing him receiving all kinds of blue ribbons and awards at science fairs. He begins to design and build a whole series of Rube Goldberg type devices to feed the dogs and take care of their other physical and even emotional needs. The kids bond also. Dave has a crush on Andi, and Heather meets up with another kid Mark (Tony Gentile) who volunteers to help because he is infatuated with her. Eventually others begin to notice the impact of the hotel. Animal control has no dogs in its cages anymore, and there is a lot of commotion going on in that so-called abandoned hotel. Eventually the hotel is discovered by the authorities leading to several interesting plot turns and twists. The confrontations between the kids, their dogs, and the authorities makes up the balance of the story. The foster care system is not kind to orphaned brothers and sisters. 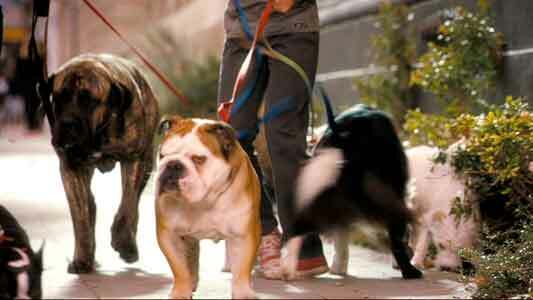 Hotel for Dogs is a fun family movie, perfect for the younger set, but delightful to anyone who loves animals. The film is worth watching just for the tricks that the dog trainers were able to have the dog complete in the film. Some absolutely charming and cute bits, especially when you see the dogs participating in one of the latest inventions that Bruce comes up with. As you would expect, the plot is one of those “check your brain at the door” stories, but it is able to climb above the level of its material by presenting some truths about the foster care system, the importance of family, and role of pets in our society in small doses that kids will understand. The film was made by the Dreamworks folks for Disney and the film ends up being better than you think it will be due to the fine production values. The film is well cast and it is easy to get behind the lead characters because of the fine acting work by Jake T. Austin and Emma Roberts. By the end of the film, you will want to adopt them and take the dog along! The one scene with Emma Roberts and Johnny Simmons at a party where the other teens there acted rudely and very judgementally about Andi being an orphan didn’t ring true. That whole scene was manipulative and unnecessary. The writers should have stuck to the dog bits or given the characters of Andi and Dave a true romantic scene where they could get to know each other better. Don Cheadle has a nice turn as the social worker with a heart. Most of the other adult characters are pretty much caricatures which is par for the course in these movies. The ending is quite unbelievable but it is also cute and funny, and follows through nicely on the whole conceit of a hotel for dogs. For a pleasant family-oriented diversion check into Hotel for Dogs for an hour and a half. You won’t be disappointed. Bruce seated on the stairs of a foster care home for boys. Bruce taking some of the hotel residents for a walk. Jake T. Austin in his role as Bruce wears low cut red chucks throughout the film. With so much of the film shot from the dogs’ point of view, the chucks stick out in the cinematography. With so much great dog action in this film, the humans need something to help them compete for your attention. Emma Roberts also sports a pair of black slip-ons when she goes on a disastrous date with Dave. The best chucks scenes are when you see Jake interacting with the dogs, like the two here where he is feeding them or walking them. Bruce starts to devise new ways to feed all of the dogs at the hotel. Hotel for Dogs. (2009) Emma Roberts, Jake T. Austin, Don Cheadle, Johnny Simmons, Kyla Pratt, Troy Gentile, Lisa Kudrow, Kevin Dillon. Directed by Thor Freudenthal. Categories: Comedy, Family.